Time : 7 pm - 9 pm. 750 Escondido Road, Stanford, CA 94305. 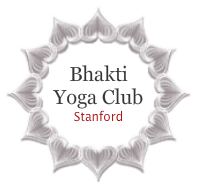 RSVP at stanfordbhaktiyoga@gmail.com or call 6507046861. Beyond the boundaries of cast, creed and color, we strive to empower YOU, by re-spiritualizing your day, through modern yogic techniques of mantra meditation, kirtan, yoga, consciousness cooking! To sum it all up, a way to have a Happy Holistic Lifestyle!